ChinaNetCloud Review 2019: Is ChinaNetCloud a Good Hosting? For more than a decade, ChinaNetCloud (CNC), a company founded by two Silicon Valley entrepreneurs, has been China’s leading cloud computing, server management, and advanced systems architecture company. The managed internet services vendor has invested heavily in complex multi-layered hosting infrastructure and servers to serve companies with the challenges they face today. 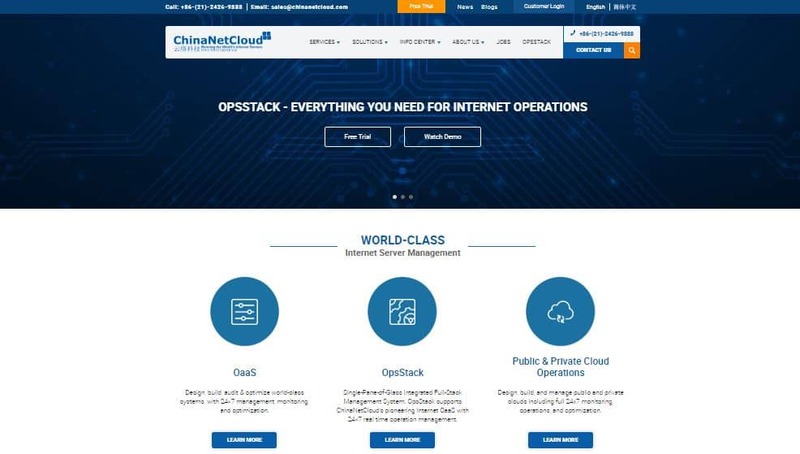 ChinaNetCloud was founded in 2008 as a cloud computing, server management, and advanced systems architecture company for big businesses, especially fast-growing entertainment and media firms in China. The company helps businesses scale up quickly while avoiding some common pitfalls that befall many fast-growing businesses. Today, ChinaNetCloud manages servers for more than 300 clients in China and around the globe. The CNC website is available in Chinese and English. ChinaNetCloud relies on AWS’s technology, platform, and best practices to provide end-to-end system architecture, setup, design, and 24/7 operations and maintenance for large corporations. All of their solutions feature fully redundant cross-border systems, in-depth active monitoring, and automatic standby unit and concurrent expansion. ChinaNetCloud sets up their clients’ infrastructure with full monitoring, support, scaling, performance, security, backups, and reliability thereby helping to improve their business availability. The company’s backup solutions ensure that clients’ databases are correctly backed up in a coherent state and with all objects and data perfectly synchronized using a multi-layered backup approach that keeps recent copies locally for faster restoration. ChinaNetCloud provides high performance infrastructure to help e-commerce websites optimize their websites through creating tailored environments that improve page loading speeds, make scalability easy, and secure the website. There are no prices indicated on the ChinaNetCloud website for any of their managed internet services. Usually, this means that the vendor’s solutions are quite expensive. This is compounded by the fact that this vendor was the first company of its kind to set up shop in China’s mainland and still dominates this space. But the other reason why the company has not been under pressure to openly discuss their pricing is the fact that they mostly deal with large, and fast-growing corporations that need custom-made solutions. ChinaNetCloud offers no money-back guarantee for any of its solutions. I could also not find any information on their website regarding their network uptime policy or downtime compensation plan. Clients can contact the ChinaNetCloud support team directly via their telephone number, email, and ticketing system. The vendor doesn’t have live chat, but is available 24/7 via the other support channels. CNC’s support team has an impressive response record, often responding to tickets in less than one hour, and in a manner that satisfies their clients. They have a comprehensive knowledge base with a lot of informative tutorials and articles, as well. Their FAQ section covers many topics and their video tutorials would be extremely helpful to any company’s in-house tech team. ChinaNetCloud is a trusted expert in system consulting and cloud computing for many fast-growing corporations in China’s mainland. For businesses looking for a full internet managed services provider, ChinaNetCloud should be on top of their list as they offer secure, reliable, and time-tested services. Wondering how ChinaNetCloud stacks up against other Web Hosting companies? Enter any other Web Hosting company and we will give you a side-by-side comparison.